It only makes sense that the Lansing Lugnuts and Burlington Bees, who enter the weekend atop of their respective divisions, are well-represented on the rosters for the Midwest League All-Star Game, which were announced Friday. The Bees will send five players to the midseason showcase, set for June 21 at Quad Cities' Modern Woodmen Park. Although the Lugnuts have only four representatives, three were named starters on the Eastern Division squad. The third-place Peoria Chiefs landed three starters on the Western Division roster, as well as two reserve players and a pitcher. Their total of six representatives matches the South Bend Silver Hawks, on the Eastern side, for tops in the league. The Clinton LumberKings, who send hurler James Paxton, are the only club with fewer than three representatives. League strikeout leader Josh Smith, who's fanned 76 for the Dayton Dragons, headlines an Eastern pitching staff that also includes Lansing's Steve Turnbull, who leads the loop with 13 saves. The Western hurlers are also a formidable group. In addition to Paxton, Wisconsin's Tyler Thornburg, who's 4-0 and ranks second in the league with a 1.31 ERA, and Beloit's Adrian Salcedo are among those charged with shutting down the Eastern offense. That's no easy task. The East squad includes South Bend's Yazy Arbelo, who leads the league with 14 homers and 43 RBIs, and Lake County's Anthony Gallas, who has a Midwest-best .350 batting average. Peoria teammates Matthew Szczur and Pierre LePage join Beloit's Daniel Ortiz on the West's impressive offense. The Eastern team will be managed by Lake County's Ted Kubiak, while Quad Cities' Johnny Rodriguez is the West skipper. 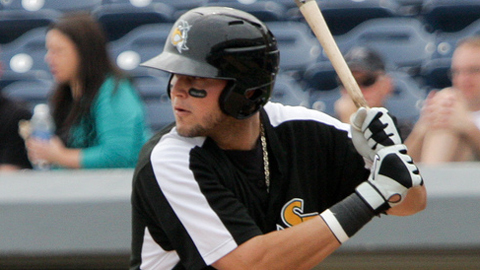 * On June 14, the Midwest League announced that South Bend's Ender Inciarte will replace Lake County's Anthony Gallas in the Eastern Division starting lineup. Fort Wayne's Rymer Liriano replaces Gallas on the Eastern Division roster. Gallas is unable to play due to promotion. Peoria's Elliot Soto and Quad Cities' Starlin Rodriguez will replace Kane County's Gerard Hall and Quad Cities' Greg Garcia on the Western Division roster. Both Hall and Garcia were promoted. On June 17, the Midwest League announced that Kane County pitcher Sugar Ray Marinon has been placed on the disabled list. Therefore, teammate Chase Boruff will replace him on the Western Division roster.